A library of ambient articulations. Browse as you see fit. A halo of silvery fur is the mind. The hieroglyph comes to be drawn with a mark on its throat, a conflation with the wattled crane, a similar migratory waterbird. 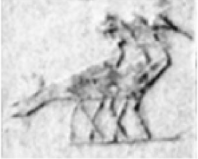 In the Pyramid of Unis the hieroglyph appears as both birds, though predominantly without the mark as an unmistakable miniature of the white stork. Three storks or cranes together form the hieroglyph that represents the power or force of a living person. The wattle becomes a hieroglyphic flag emphasising the throat of the crane, which is known for its beautiful sound. The sky filled with the sound of cranes, like the sound of wild geese, is a marker for the turning of the seasons. The emphasis, the mark, flags what is relevant in the animal. The raised tail of the dangerous wild dog is lightning. A halo of silvery fur is the mind. In Arabic the action of a verb or the quality of a noun becomes emphatic, is intensified, by doubling the sound: ‘wuswus’/whisper, ‘rufruf’/flutter, ‘loglog’/babble. ‘Hubbub’ is a doubling of the Arabic word for “love.” ‘Ruckus’ is the Arabic word for “dance.” In the English version of the word the sound of the central consonant is intensified to intensify the action conveyed in the word. ‘Alfalfa’ is Arabic for “a thousand thousand,” the best fodder crop; “pepper” is the English pronunciation of ‘felfel’. 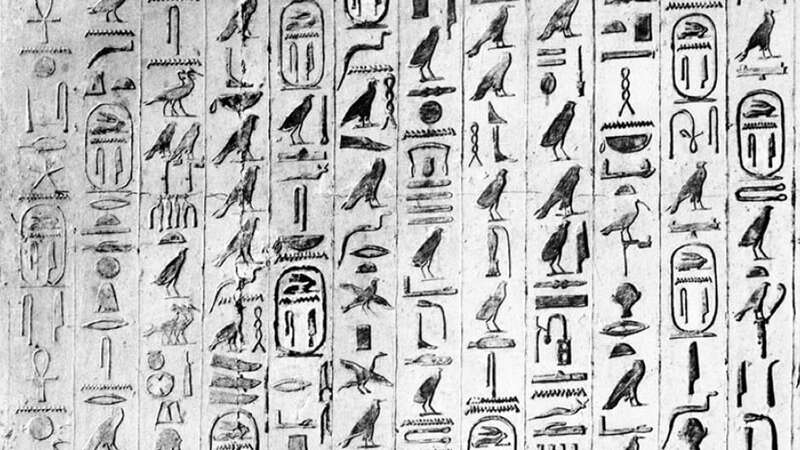 This kind of linguistic doubling is a common device in Egypt, and it is a common device in hieroglyphs. I want to live deep and I want to live loud. Four British men and women share something in common with every single one of us across the globe – one day they will die. The difference is that they know with certainty that it will be sooner rather than later. Matthew Stride has a brain tumour; Sophie Sabbage has stage four terminal cancer; Vivek Gohil is now in a wheelchair due to Duchenne muscular dystrophy; Mandy Paine has chronic obstructive pulmonary disease and needs oxygen to breathe. The two most important dates in our lives are the day we are born and the day we die. What happens in between those two dates makes a life. 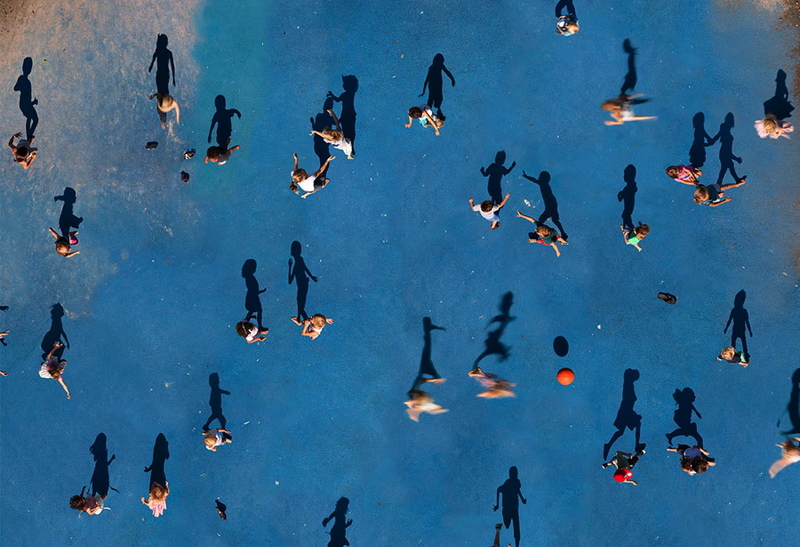 What is striking when people know they will soon die – those who raise money for charity, start helplines or write books to help others in a similar condition – is the overall message of love and hope. The trails we create from the soil are likewise born of a mixture of mud and thought. Over time, more thoughts accrete, like footprints, and new layers of significance form. Rather than mere traces of movement, trails became cultural through-lines, connecting people and places and stories—linking the trail-walker’s world into a coherent, if fragile, whole. DR. ROVELLI: Yes. A thing is something which remains equal to itself. A thing — a stone is a thing because I can ask where the stone is tomorrow, while a happening is something that is limited in space and time. I don’t know. A kiss is not a thing, because I cannot ask, “Where is a kiss tomorrow? Where’s this kiss tomorrow?” I mean, it’s just happened now. MS. TIPPETT: I see. OK.
DR. ROVELLI: And I think that we don’t understand the world as made by stones, by things. We understand a world made by kisses, or things like kisses, happenings. In other words, the elementary quantities or ingredients for describing the world are not things which remain through time. They are just limited in space and time. And I think which remain through time are processes that repeat themselves. A stone is just a common flickering of electrons and things and stuff, which remains together not even forever, of course, because it goes into powder for a long time, for a while. So, to better understand the world, I think we shouldn’t reduce it to things. We should reduce it to a happening, and the happenings are always between different systems, always relations. Or always like a kiss, which is something that happens between two persons. MS. TIPPETT: So, even for you, a stone is a happening, is seen in with a long expanse of time and an understanding of how it became what it is. It’s a happening, not a thing. DR. ROVELLI: Yeah. I mean, we live 100 years, but suppose we lived a billion years. A stone would be just a moment in which some sand gets together and then it disaggregates. So it’s just a momentary getting-together of sand. 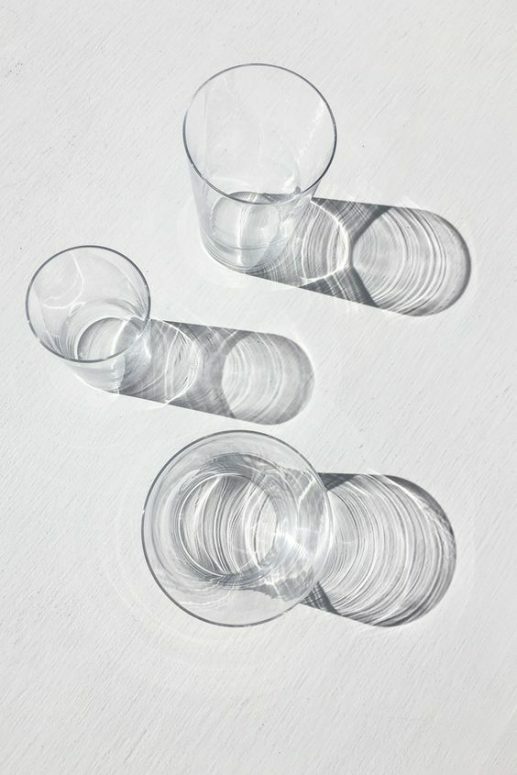 The permanence of things is — it’s a matter of — we look at them for a short time with respect to their own staying-together. Chrysopelea paradisi is one of five species of tropical lowland tree snakes of southern and southeast Asia that together comprise the genus Chrysopelea, the “flying snakes”. 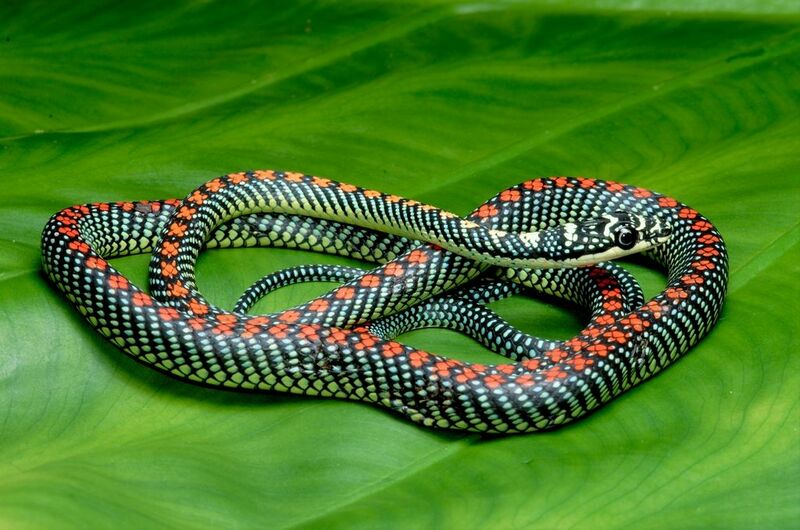 Chrysopelea snakes are on the order of 0.6–1.2 m in length, with a body mass ranging from tens to a few hundred grams. 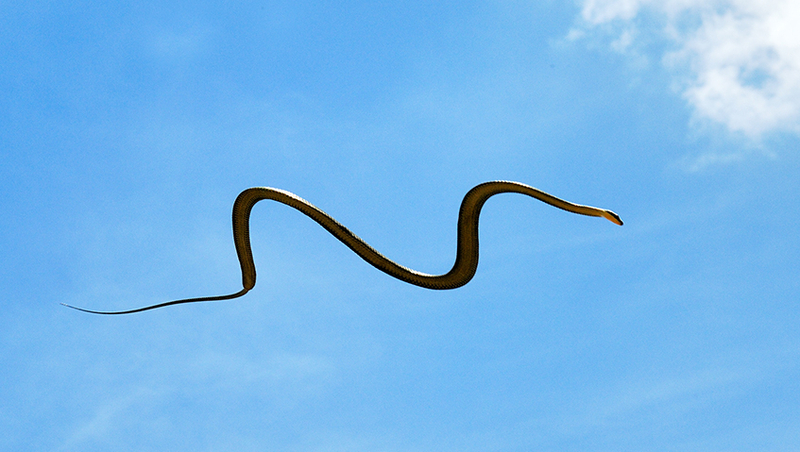 Chrysopelea “flying” snakes are the only limbless animals that glide through air. These snakes can actively launch by jumping, maintain a stable glide path, manoeuvre, and safely land without injury. As the snake becomes airborne, the body flattens sequentially from head to vent, forming a cross-sectional shape that is roughly triangular, with a flat surface and lateral ‘‘lips’’ that protrude ventrally on each side of the body; these may diminish toward the vent. A glide trajectory is initiated with the snake falling at a steep angle. As the snake rotates in the pitch axis, it forms a wide ‘‘S’’ shape and begins undulating in a complex three dimensional pattern, with the body angled upward relative to the glide path. The head moves side-to-side, sending traveling waves posteriorly toward the tail, while the body (most prominently, the posterior end) oscillates in the vertical axis. These active movements while gliding are substantially different and more dynamic than those used by any other animal glider. As the snake gains forward speed, the glide path becomes less steep, reaching minimally recorded glide angles of 138. In general, smaller snakes appear to be more proficient gliders. 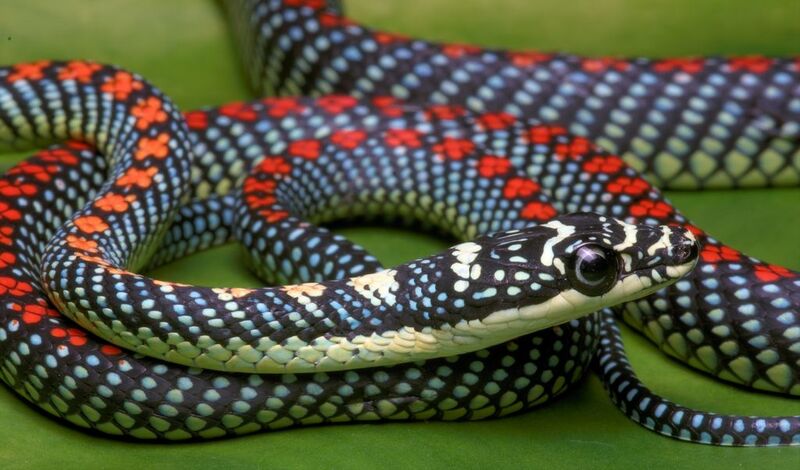 Morphologically, Chrysopelea appear to be typical snakes, with no special appendages, skin flaps, or other features such as are used by other flying animals. Instead, the snake undergoes aerial locomotion by using its entire body as a flattened, moving wing, constantly reconfiguring it throughout flight. All sundial mottos are sad like that. The earliest sundials, from Ancient Egypt to China to Europe, were often marked with dedications to god(s), patrons, and/or the craftsmen who made them. In the 1500s sundials began bearing mottos relating to time—its passage, the limited quantities allotted, how it should be spent, or as a brief memento mori to the reader to stop looking at the sundial and get on with their life. Sundials represent a willful, anachronistic affectation in a world that has begun to dispense with clocks and watches. Latin is a common language for the mottos: whether as quotations taken from the Roman writers Ovid, Martial, or Horace, or as translations of time-related sentiments. Mechanick Dialling, a 1769 manual for creating sundials, includes 300 “Latin mottos for dials, with their Meaning in English”, indicative of an expectation that a motto would be added. Margaret Gatty, who wrote the book on sundials (“The Book of Sundials”), collected 1,682 mottos in an appendix to her exhaustive history, taken from instruments all over Europe. Vidi nihil permanere sub sole. (I have seen that nothing under the sun endures). Desert varnish or rock varnish is an orange-yellow to black coating found on exposed rock surfaces in arid environments. Desert varnish is usually around one micrometer thick and represents nanometer-scale layering. Rock rust and desert patina are other terms which are also used for the condition. 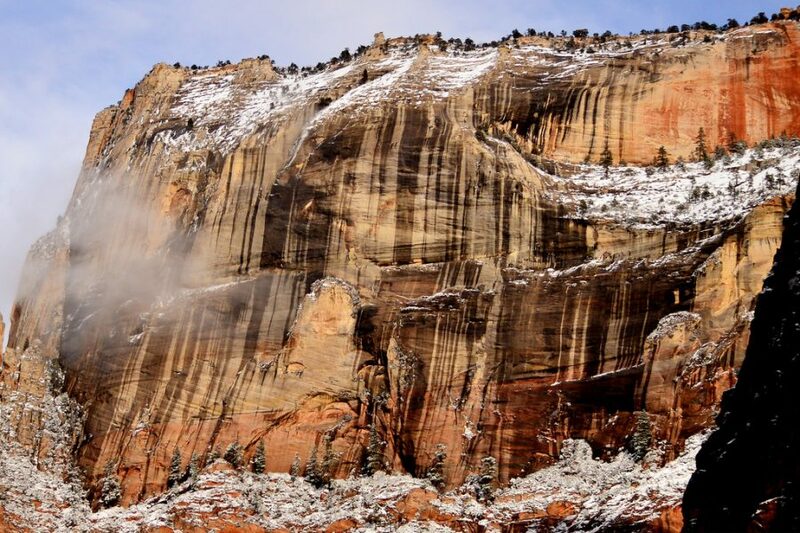 Desert varnish forms only on physically stable rock surfaces that are no longer subject to frequent precipitation, fracturing or wind abrasion. The varnish is primarily composed of particles of clay along with iron and manganese oxides. There is also a host of trace elements and almost always some organic matter. The color of the varnish varies from shades of brown to black. Originally scientists thought that the varnish was made from substances drawn out of the rocks it coats. Microscopic and microchemical observations, however, show that a major part of varnish is clay, which could only arrive by wind. Clay, then, acts as a substrate to catch additional substances that chemically react together when the rock reaches high temperatures in the desert sun. Wetting by dew is also important in the process. Even though it contains high concentrations of iron and manganese, there are no significant modern uses of desert varnish. However, some Native American peoples created petroglyphs by scraping or chipping away the dark varnish to expose the lighter rock beneath. Desert varnish often obscures the identity of the underlying rock, and different rocks have varying abilities to accept and retain varnish. Limestones, for example, typically do not have varnish because they are too water-soluble and therefore do not provide a stable surface for varnish to form. Shiny, dense and black varnishes form on basalt, fine quartzites and metamorphosed shales due to these rocks’ relatively high resistance to weathering. 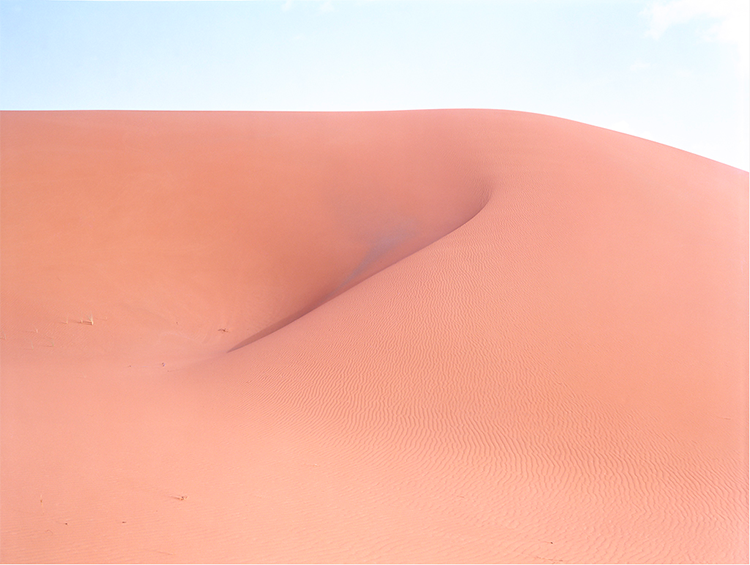 Across the world’s great deserts, a mysterious sheen has been found on boulders and rock faces. These layers of manganese, arsenic and silica are known as desert varnish and they are found in the Atacama desert in Chile, the Mojave desert in California, and in many other arid places. 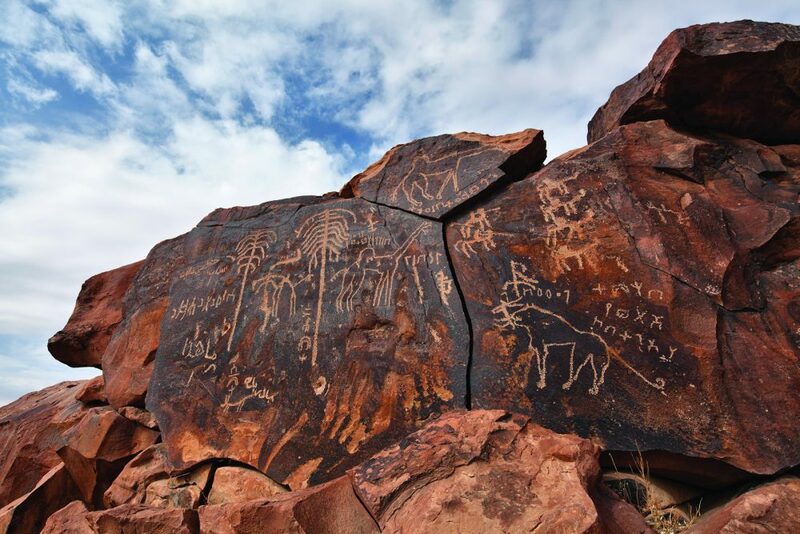 They can make the desert glitter with surprising colour and, by scraping off pieces of varnish, native people have created intriguing symbols and images on rock walls and surfaces. How desert varnish forms has yet to be resolved, despite intense research by geologists. Most theories suggest it is produced by chemical reactions that act over thousands of years or by ecological processes yet to be determined.